QUALITY NEW CONSTRUCTIONS!!! ALL THE FEATURES OF A SINGLE FAMILY HOME WITHOUT THE EXTERIOR MAINTENANCE! RANCH STYLE, SPLIT BEDROOM DUPLEX CONDOS. OPEN FLOOR PLAN WITH TALL CEILINGS, CUSTOM CABINETRY, QUARTZ / CORIAN COUNTERTOPS, SS APPLIANCES, CERAMIC TILE BATHS, GAS FIREPLACE WITH STONE SURROUND. 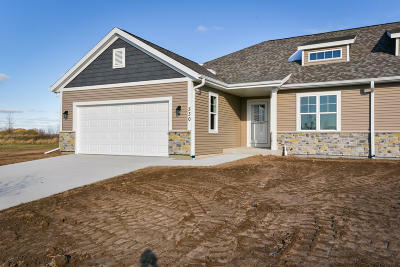 INSULATED, DRY WALLED, OVERSIZED 2 CAR GARAGE WITH OPENER. MANY UPGRADES. HUGE BASEMENT WITH EGRESS WINDOW AND PLUMBING ROUGH-INS. CONCRETE DRIVEWAY, SIDEWALK AND PATIO. FULLY LANDSCAPED. ONE TIME $350 RESERVE ACCOUNT FEE PAID BY BUYER AT CLOSING. ONLINE BROCHURE AT WWW.HIGHLANDCUSTOMHOME.COM/BELGIUM.